Following last year’s expansion to include three nights of music, America’s premier rock festival–ROCK ON THE RANGE–has once again upped the ante by growing to three full days of music for this year’s annual event, May 16, 17 & 18 at Columbus Crew Stadium in Columbus, OH. Featuring headlining sets from Guns N’ Roses, Avenged Sevenfold and Kid Rock, the lineup includes more than 60 of the World’s hardest rocking acts including: Five Finger Death Punch, Slayer, Staind, Motorhead, Seether, Chevelle, Alter Bridge, Mastodon, Black Label Society, Killswitch Engage and many more (the full line-up is below). Beyond the expanded musical offerings, this year’s festival will include the return of ROTR Comedy Tent, featuring Jim Breuer, Jim Florentine and many up-and-coming comedians. Weekend passes including Field GA, Stadium GA, hotel and VIP packages and a stadium 4-pack go on sale Friday, January 24 at 10:00 AM (ET). Additional details about the variety of ticketing, hotel and camping packages can be found at RockOnTheRange.com. 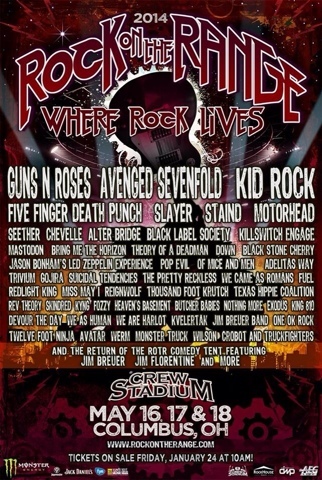 Visit the website, http://www.facebook.com/rockontherange and http://www.twitter.com/rockontherange for the most up-to-date information. Guns N’ Roses, Avenged Sevenfold, Kid Rock, Five Finger Death Punch, Slayer, Staind, Motorhead, Seether, Chevelle, Alter Bridge, Mastodon, Black Label Society, Killswitch Engage, Bring Me The Horizon, Theory of a Deadman, Down, Black Stone Cherry, Jason Bonham’s Led Zeppelin Experience, Pop Evil, Of Mice & Men, Adelitas Way, Trivium, Gojira, Suicidal Tendencies, The Pretty Reckless, We Came as Romans, Fuel, Redlight King, Miss May I, Reignwolf, Thousand Foot Krutch, Texas Hippie Coalition, Rev Theory, Skindred, Kyng, Fozzy, Heaven’s Basement, Butcher Babies, Nothing More, Exodus, King 810, Devour the Day, We As Human, We Are Harlot, Kvelertak, Jim Breuer Band, One OK Rock, Twelve Foot Ninja, Avatar, WERM, Monster Truck, Wilson, Crobot and Truckfighters with comedians Jim Breuer, Jim Florentine and more. Presented by Danny Wimmer Presents, AEG Live and Crew Stadium, ROCK ON THE RANGE is a multi-stage music and lifestyle event featuring a potent lineup of bands on three stages and is proud to be sponsored by Monster Energy, who return as the Main Stage sponsor; Crazy Dave’s Music Experience (an interactive exhibit that features all the elements that are involved in making music in in a professional band setting); the Ernie Ball Battle Of The Bands Contest (launching this Spring for your chance to play the stage at ROTR). The nationally renowned festival, part of the World’s Loudest Month Festival Series, is centrally located in the heart of the country and has annually drawn huge weekend crowds since its inception in 2007, including a sold-out crowd of over 103,000 fans in 2013.